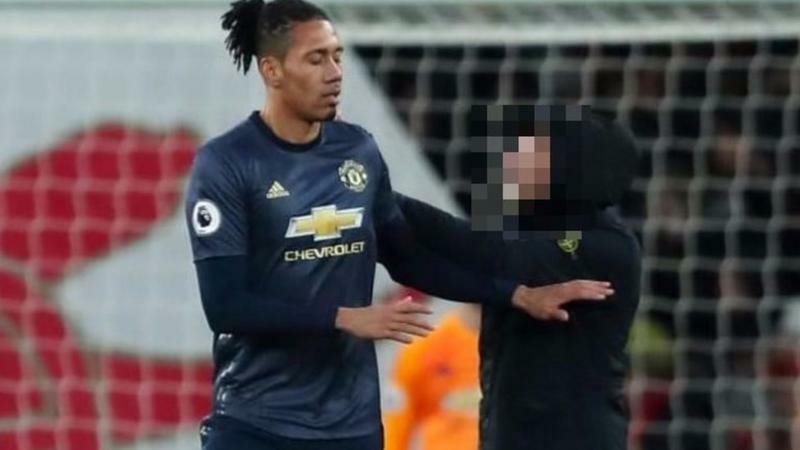 Arsenal have been charged by the Football Association after a spectator confronted Manchester United defender Chris Smalling on the pitch during their Premier League match on Sunday. Gary Cooper, 30, from Surrey, has been charged with common assault and encroaching on to the pitch. He was bailed to appear at Highbury Corner Magistrates' Court on 26 March. The incident occurred in the second half of the game at Emirates which Arsenal won 2-0. Arsenal have until 22 March to respond to the FA charge. An FA spokesperson said: "It is alleged the club failed to ensure that its spectator(s) conducted themselves in an orderly fashion and refrained from encroaching onto the pitch during the Premier League fixture against Manchester United on Sunday." The incident occurred the same day as Aston Villa midfielder Jack Grealish was attacked during a Championship match against Birmingham City. Birmingham fan Paul Mitchell has been jailed for 14 weeks after running on to the pitch and hitting Grealish from behind about 10 minutes into the game. City have also been charged by the FA for failing to control their fans. Punish the pitch invader for committing the criminal action not the club. Pitch invaders don't care about hurting the club or they wouldn't do it in the first place. Not sure why they're holding the team responsible for this.